The 2019 Professional Development Program for Doctors will be hosted at the Shoal Bay Country Club, located on the picturesque waters of Shoal Bay, Port Stephens. Shoal Bay is just a 2.5-hour drive from Sydney and only 30 minutes from Newcastle airport. Full wheelchair access to the venue is available from the front entrance of the Shoal Bay Country Club. If you require a wheelchair space to be reserved in the plenary room, please contact Alignment Event Solutions prior to the Conference. There is ample street parking. For any special requests please email the conference organiser when booking. 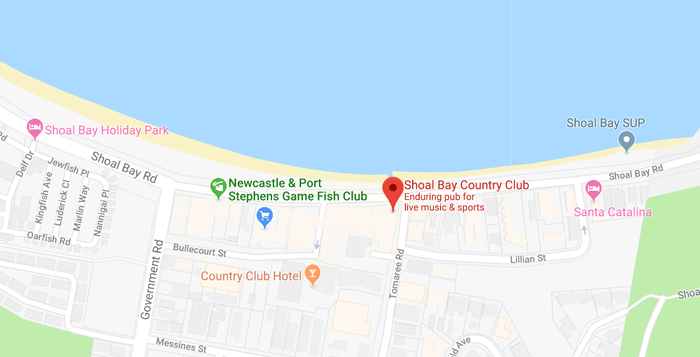 Shoal Bay Country Club is located 36.7km (30 minute drive) from Newcastle Airport CLICK HERE for directions.